The Loft Gallery at The Smithy welcomes Jamie Accashian of Woodbury, CT. Jamie’s mixed media collage will be on view Saturday, March 2 through Sunday, April 14, 2019. An opening reception will take place on March 2, 2019 from 4-6pm. The event is free and open to the community. Guests can meet the artist, enjoy wine and light fare, and listen to live jazz by Bentley Lewis. Jamie is best known for her layered mixed media, which combines painting, printmaking, and collage elements. The Woodbury CT native graduated from Rhode Island School of Design (RISD) with a degree in Illustration in 2013. In 2012 she studied in Rome, Italy, where she began printmaking and sketching outdoors regularly out of a fondness and curiosity for layered architecture. After graduation, Jamie moved to Brooklyn, NY and worked for Mary Howard Studio. Jamie collaborated with set designers to effectively promote various high-profile fashion and media brands by assisting in concept development, material sourcing, and prop construction. A natural progression, she was then offered an opportunity as a Manager and Painter at nearby backdrop painting company, Oliphant Studio. She worked directly with designers including Tory Burch, Marc Jacobs and Ralph Lauren by creating initial samples for artwork and collaborating closely with them throughout the production process. While at Oliphant, she was commissioned by J.Crew to paint 1000 articles of clothing to be sold globally. The studio environment, which was rich with color and texture, also fascinated her and influenced her personal work. Her most recent position in New York City was at a startup technology company called Artsy, where their goal was to make art globally accessible. As Executive Assistant, she enjoyed learning about the technical side of art business and sales. 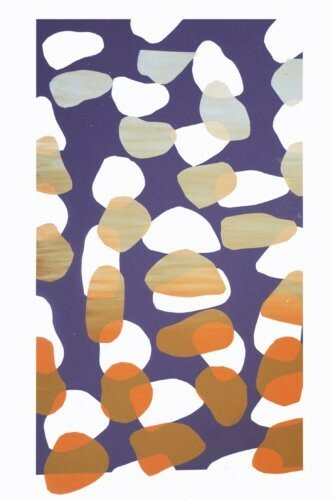 Jamie derives inspiration from other layer-focused work, including Matisse’s cut paper collages, Nathalie Du Pasquier’s decorated surfaces, her own travels, and traditional Japanese woodblock printmaking techniques. For more information about Jamie, visit www.jamieaccashian.com. The Loft Gallery is located on the second floor of The Smithy Store, a recently renovated barn that once housed the village Smithy shop. The charming retail and gathering space offers a unique, curated line of locally sourced specialty food, products and gifts from within a 70-mile radius. The Smithy Store is located at 10 Main Street in New Preston, CT. www.thesmithystore.com (860)868-9003.